The term Footitis is well-known to many boaters. It’s the imaginary “disease” one comes down with after buying a boat and thinking that it would be perfect if it were just a couple of feet longer. 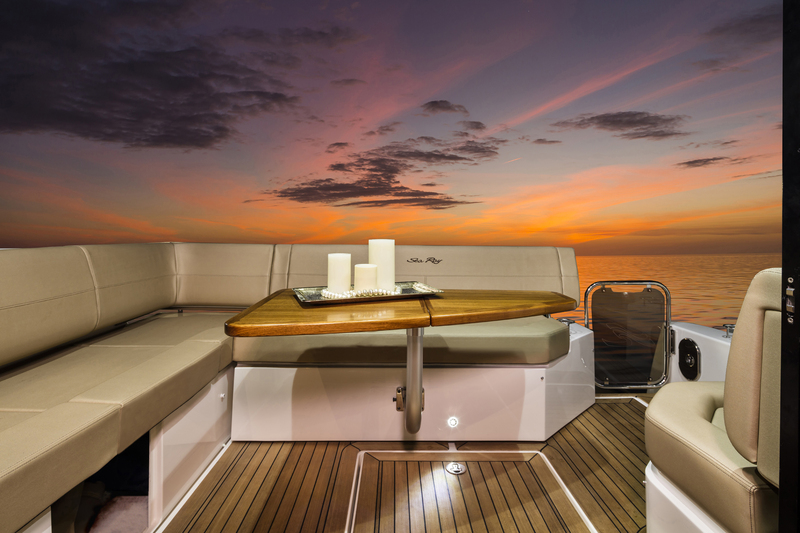 Well, as the owner of a 380 Sundancer I can safely say the 450 made me come down with a major case of Footitis – one that haunts me to this day, months after seeing the debut hull at the 2016 Miami Beach yacht show. 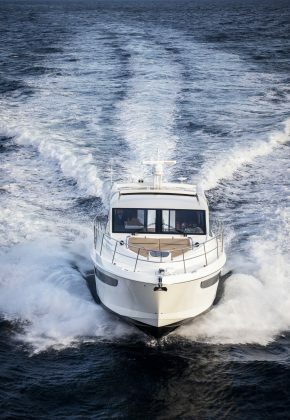 As the owner of a cruiser and lover of the summer live-aboard/floating-cottage life my one pet peeve with most new sport yachts is the lack of storage. Too often I find the boats are designed to be giant day boats. And sure, the manufacturers know what they’re doing and are responding to customer demand but when it’s not my demand, I just don’t appreciate it. Selfish, but true. They have better performance than their older cousins and the interiors look like something out of a designer catalogue, but when it comes down to the nuts and bolts of living on a boat, even just for weekends, you need space to put your clothes, towels, and the cocktail-fixin’ paraphernalia for when you’re at the dock or on the hook. It’s all got to go somewhere! Happily, the 450 Sundancer has it and in an almost embarrassingly overabundance when compared to similar size boats. 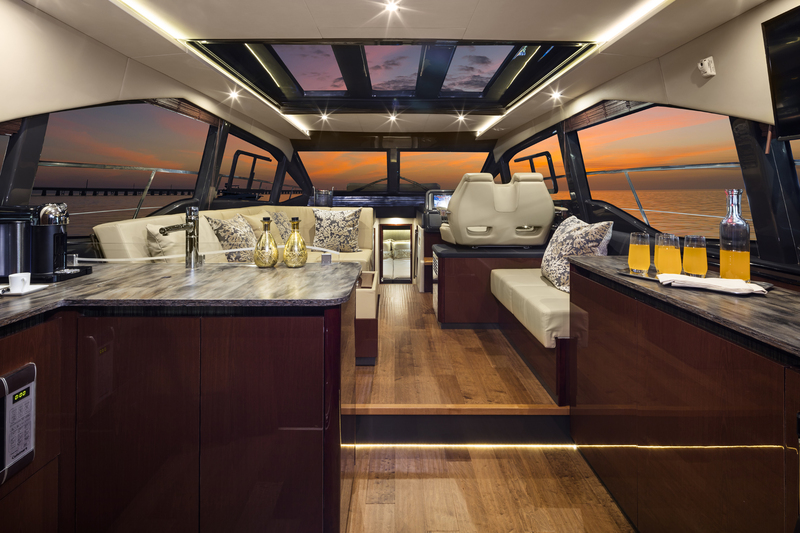 Sea Ray is happy to brag about it and that they didn’t sacrifice room for guests, galley or good times. There is a full-size linen closet down below that fits nicely under the helm and provides that much needed, easy-access storage. Even still, there is a roomy bow guest stateroom with large hanging closets and a downright large head with shower. 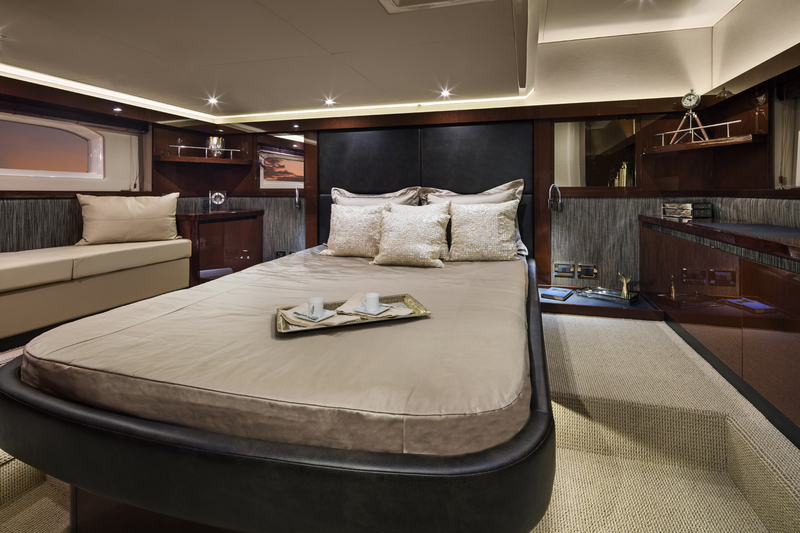 The master stateroom is full-beam midship with a ton of storage from hanging locker with fold-up shelving, which is brilliantly simple and useful. There are large drawers and you have the option of love-seat sized settee or another set of drawers. Up in the salon, the clever convertibility continues with the electrical panel hidden behind the backrest. The galley is placed at the back of the main level salon so it can be used either indoors or, by sliding open the glass doors, with easy access to the cockpit. There are side-by-side fridges and an optional wine fridge. 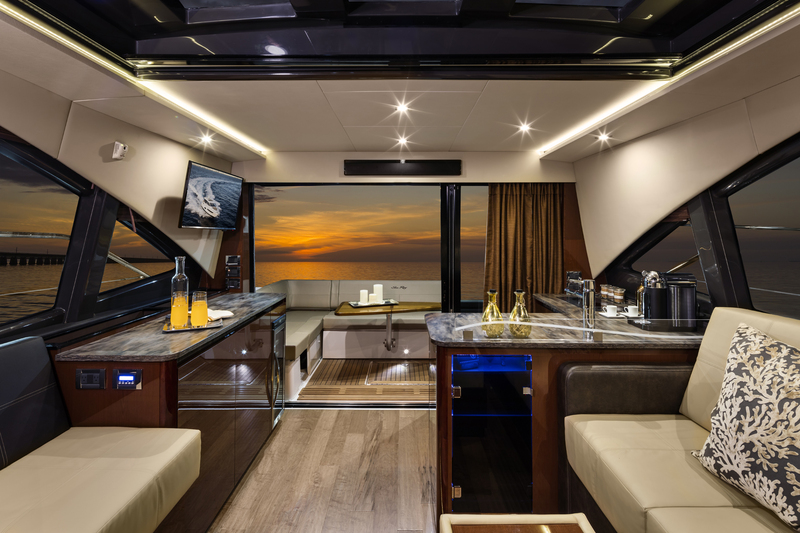 The TV is also mounted with the same dual-purpose, on a swinging arm that can slide around to face into the salon or out into the cockpit where, if you want more room, the aft bench seating can slide out mechanically about 16-inches for even more room. There’s storage under all these seats including an option of having one made into an insulated, cooler-type compartment, too. Down on the swim platform you have easy access to more storage, the transom gourmet space featuring a grill and sink and, as a cruiser-owner, something I really appreciated: easy access to shore power and water connections. 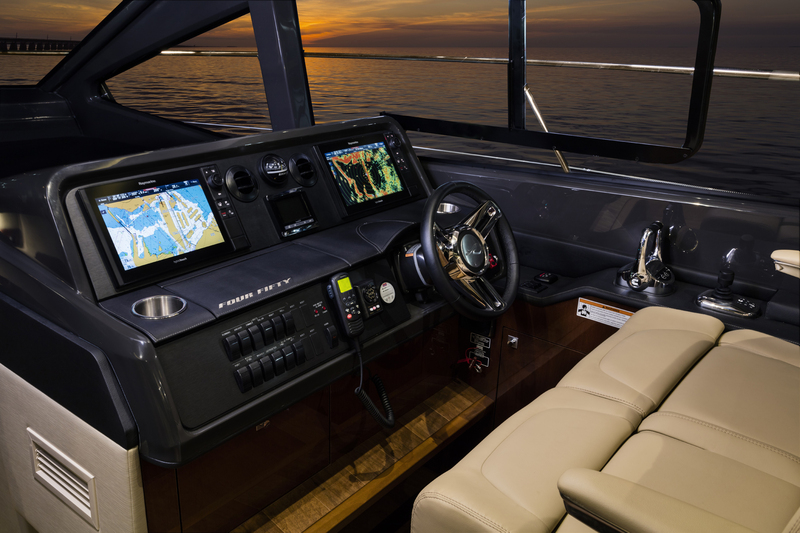 There are just too many features to list and if you want to see them all, check out the walk-through we did with Sea Ray on the debut model. 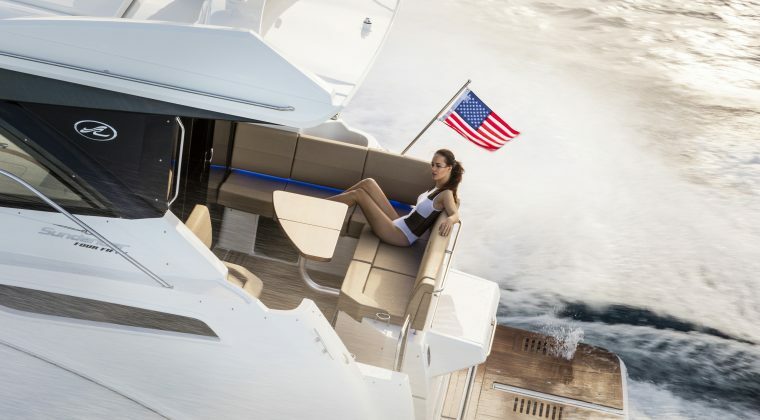 From the high quality spotlight and loungers on the bow right back to the swim platform, every inch impresses, with no detail too small not to be designed to maximize functionality. The Sundancer name is part of the old guard but the 450 takes a fresh approach. One I hope sets a new standard.